Let's start Mantic's Abyssal Dwarvs review saying that they aren't a completely new miniatures, they are instead a plastic/metal hybrid. 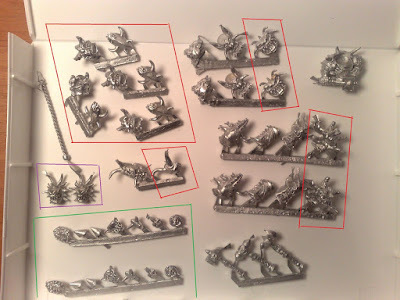 That means that on each box you will find some plastic dwarfs sprues plus some metal bits to customize them, that means also that once you have done putting together your Abyssal Dwarfs you will have lots of extra bits left. 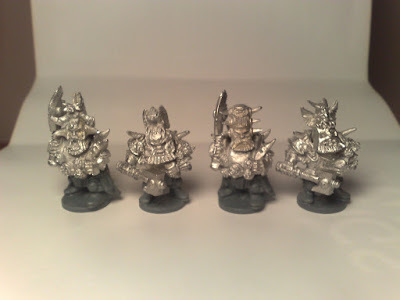 The bits highlighted in red are mask/helm toppers, you have to glue them on top of a plastic dwarf, the other heads are complete so you glue them instead of a normal dwarf head. Bits in green are some shield details that you can glue on the plastic shields. The two head in violet are for the mastiff (the two Dwarfs Ironclad troop sprues has one mastiff each). The remaining pieces are a banner pole (on the left), three close combat weapons (on the bottom) and one upper body (on the right). 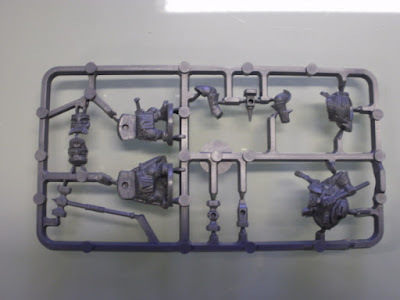 The upper body is supposed to be glued with a lower part body from the plastic sprue, this particular one with the hammer matches the lower part body without the cape. Note: the picture on the box shows 2 head that are NOT in the box, I'm talking about the one shaped as a dragon and the one shaped as an eye. This is an example of the command group, I used the upper body part for the unit's champion. There are two kind of upper body part, the ones with the axe (in blue) should be used with the lower body part with the cape, the other ones with the hammer (in green, same as the one in the blacksouls box) should be used with the lower body part without the cape (try for yourseld, it doesn't fit the other one!) Since you have 8 upper body parts you will have to build the two remaining troopers (musician and standard bearer) using the plain plastic dwarf. 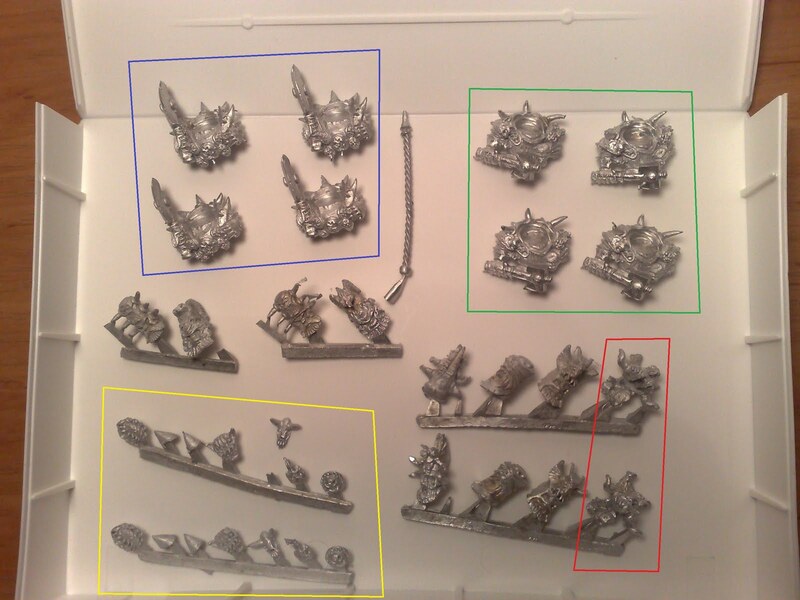 The bits highlighted in red are mask/helm toppers, you have to glue them on top of a plastic dwarf. The other 10 heads are complete, if you look closely some of them are the same as the ones in the blacksouls box while four are different. This is an example of some troopers you can build. 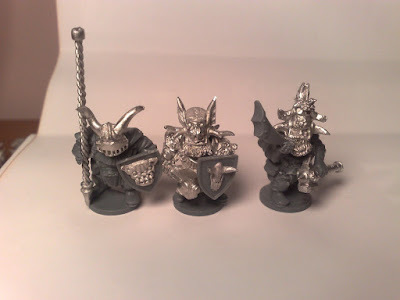 I think this are Mantic's best miniatures so far, some might complain that the plastic/metal hybrid is a weird solution but miniature looks pretty good. 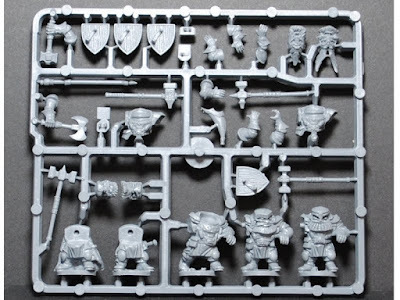 One of my biggest complain about the Mantic's "good" dwarfs is the lack of options (there are just 2 types of head in the box plus the ones for the champion) and I believe that Abyssal dwarves kits are going in the right direction adding more options. The metal bits aren't top quality since they sometimes miss some piece and they show a lot of fusion lines so you will have to clean them up but with some work you can fix them.